If you enjoy being able to play poker online, you’ll no doubt want to look at improving your gameplay. One quick and easy way to do this is through getting to know your poker hands. By understanding how poker hand rankings work, you can aim for those better overall poker combinations, while working the online casino poker game you play to your advantage as a player! The trick to playing the best poker game is learning which poker hand rankings are the highest and which are the lowest. Once you are aware of these, you can then work on applying your newly found poker hands to all online casino poker games as they are standard for all sites. This includes here Stud, Omaha and even Texas Hold’em. It’s therefore worth taking the time to learn the card combinations and even keeping this information with you as a reminder, as you play each game. 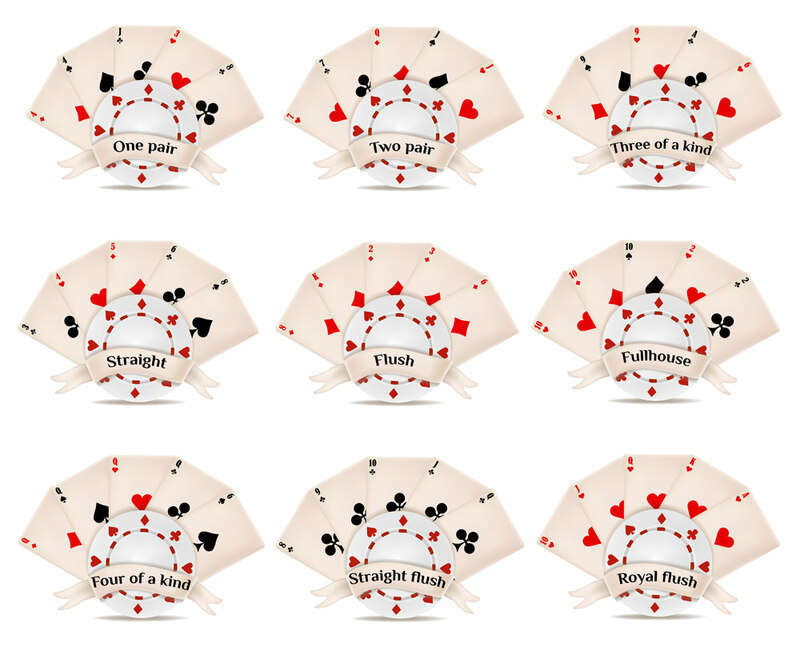 Royal Flush: One of the best hands of them all in poker, due to its highest possible value when compared to any other poker hand, a Royal Flush is the term used to describe cards in the matching suit including the King and Queen, the Ace, the Jack and the Ten. Four of a Kind: Often referred to as Quads, this is any number of four cards which appear in the matching rank in each one of the four suits. Full House: Often referred to as a Full Boat, this includes a pair from the matching rank, as well as three others, from the same rank. Flush: All five cards of the same suit, but not necessarily in any consecutive numerical order. The highest card in this flush will determine its rank. Straight: All five cards not in the same suit but in numerical order. Three of a Kind: Often referred to as a Set or Trips, this includes three cards which are of the same rank, alongside another two cards form another rank. Two Pair: A combination of two cards from the same rank combined with another of two cards form the same rank. The highest pair here determines the higher ranking of this hand. One Pair: As it states, one pair of cards from the same rank, alongside another three non-matching cards. High Card: Comprising of any other hand which is not mentioned above. Usually consists of at least two different suits without any matching cards and no consecutive numerical order. Though you do not have to memorise all these poker hand rankings to be able to play a game of poker, having a knowledge of them before you take up each poker game certainly makes you aware of which hands are the strongest and which are the weakest. This gives you an idea each time you play as to which hands you need to beat your opponents. However, rather than memorising, the best way to work on such knowledge is to play on a regular basis and have this list of rankings nearby as a guide throughout. There’s no doubt that by mastering your poker hands, you gain the ability to play a more improved and indeed thrilling game each time you play your poker games online. Furthermore, once you gain a deeper understanding of the game of poker, you can then work on going up against the more skilled and experienced players, confident that you can hold your own in such influential games, with your new-found poker hand rankings knowledge. Ultimately, you pave the way for more success as you do so, as with better poker hands comes the ability to win more significantly every time you attempt an online casino poker game!